Mirrorless cameras are missing one thing: the mirror. Sure, not having a swinging mirror in the body enables all sorts of things, including smaller bodies, lower weights, fewer moving parts, live-view electronic viewfinders, etc. Unfortunately, it also allows dust and dirt to more easily come into contact with the sensor. So, as I recently discovered when I bought a new mirrorless camera, dust is a more pronounced problem. When you change lenses on a mirrorless camera, the sensor is sitting there smiling at you and practically reaching out to grab every bit of dust that happens to be floating by, so sensor cleaning becomes more important than ever. And it’s always been a fact of life with DSLR cameras too. 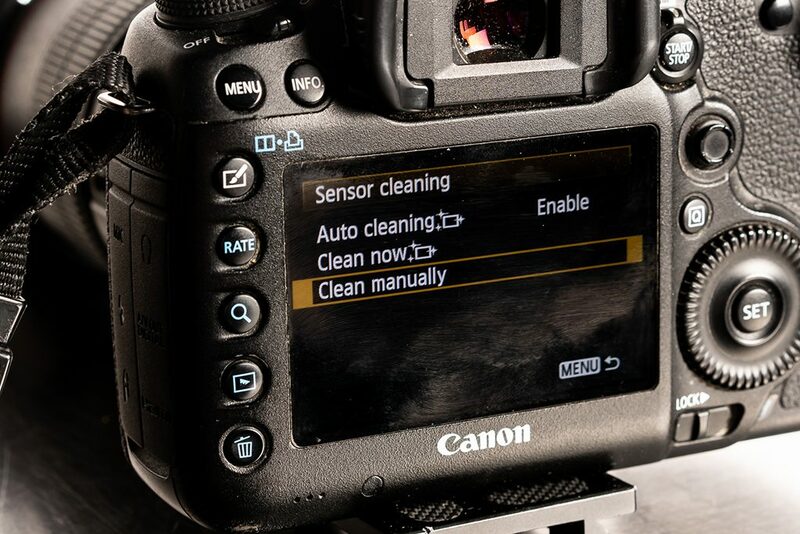 In any case, here are two great ways to clean your sensor, simply, safely and effectively. 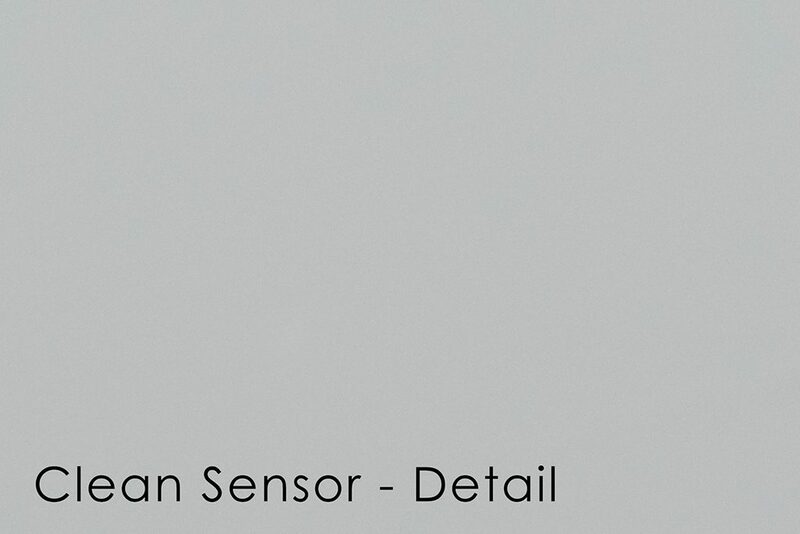 I start by checking to find out exactly how dusty my sensor is. To do this, I set a long shutter speed of, say, five or more seconds, and a small aperture of ƒ/16 or ƒ/22. The small aperture makes any dust particles appear more well defined on the sensor (which is also good to know if you get dust on your sensor during a shoot and want to minimize its appearance; if that happens, just open up the aperture). Set the ISO such that you’ll create a normal exposure for the ambient light in the room in which you’re working (though try to keep it fairly low—thus the long shutter speed) and then defocus the lens and point your camera at a blank wall—preferably white or light in color—and take a picture. Handholding the camera with the slow shutter speed, combined with the defocused lens, will ensure you don’t get any actual detail in the picture so the only thing you should see is a bright blurry background and any well-defined dust spots from particles on your sensor. After cleaning, you can check your progress by repeating this process to ensure your dust removal has been successful. 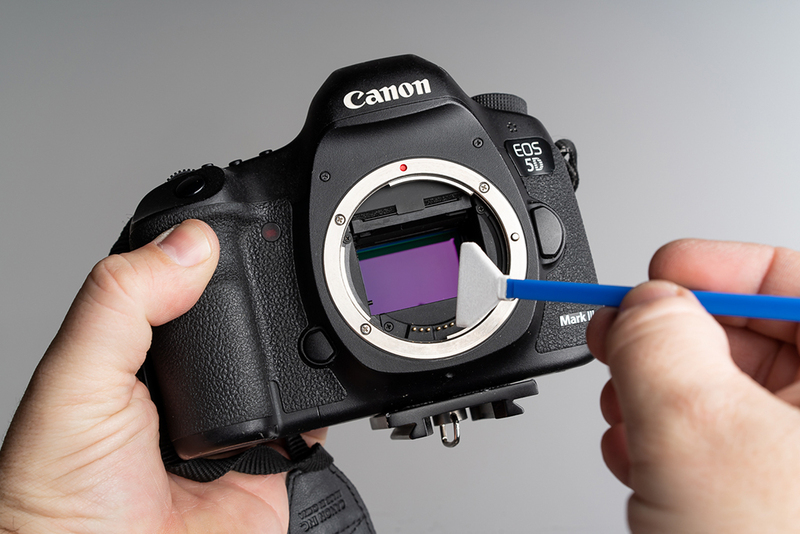 The safest way to clean your sensor is to avoid touching it entirely. That means cleaning it with air. Don’t rush off to grab your canned air, however. Never use compressed air to clean a camera sensor, as it’s not only too powerful, but the gas inside can briefly liquefy and stain your sensor. 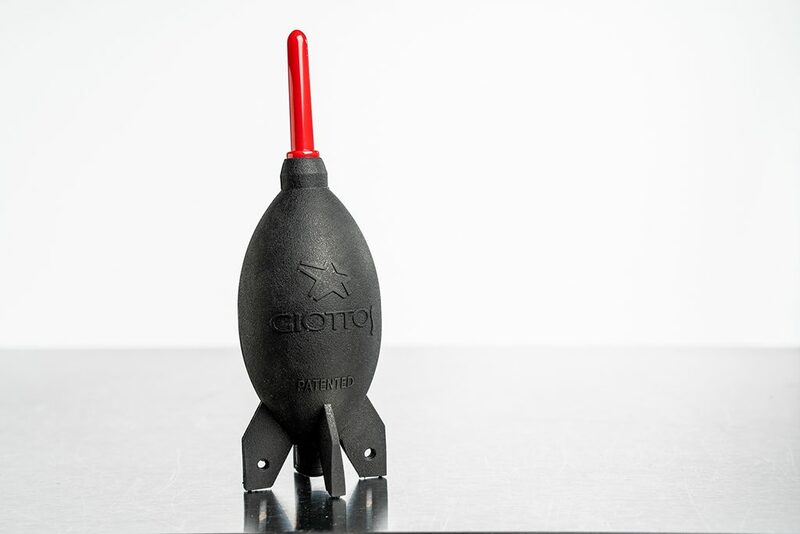 Instead, use a hand-powered blower, such as the Giottos Rocket Blaster, which is very strong but won’t create enough pressure to damage your sensor and which uses no propellant or gasses at all. Start by ensuring your camera’s power is off, which will keep the sensor from acting like an electrified dust magnet, and make sure you’re in a clean, dust-free environment. Then, simply remove the lens from your camera. If it’s mirrorless, you’re ready to proceed, but if it’s a DSLR, you’ll want to place the camera in sensor cleaning mode, which is accessed from the camera’s menu. With the sensor exposed, simply place the tip of the dust blower near the sensor (but under no circumstances risk touching it) and squeeze. I like to hold my camera upside down, with the opening in the body facing the floor so that when the air blows the dust off the sensor, it falls out of the body rather than back into it. If it’s more convenient, you can place the camera body on a tripod to hold it steady while you work. Blow the duster inside the camera several times, then replace the lens and check your progress. If the sensor is clean, you’re done. If it’s not, though, try repeating the process. And if that still doesn’t work, consider stepping up to a more intensive cleaning with a cotton swab that’s specially made for sensors. If your sensor is marred with stubborn, stuck-on dirt spots or, even worse, oil from a fingerprint, you’re the ideal candidate to use a sensor-cleaning swab and cleaning solution to manually wipe the sensor clean. To do this, start by purchasing a disposable swab that’s not only designed specifically for cleaning camera sensors, but one that’s sized appropriately for your sensor—i.e. full frame versus APS-C, etc. (There are many brands to choose from, including VSGO, Visible Dust, Photographic Solutions and Delkin Devices.) 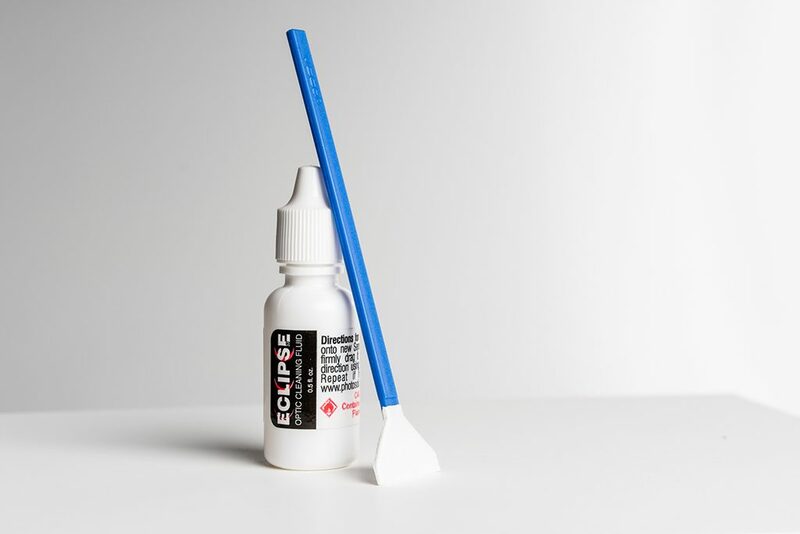 Along with the swab, purchase sensor-cleaning solution such as Photographic Solutions Eclipse optic cleaner, which is applied to the swab, never directly to the sensor. Again, with the sensor accessible and ready for cleaning, place two drops of cleaning solution on one side of the swab. Wait a moment so that the swab is damp instead of dripping wet, then with the swab held at approximately a 45-degree angle (as opposed to 90-degrees from the surface of the sensor), press and drag the swab across the sensor in a single, fluid motion—much the same way that you might squeegee a window. Then, flip the swab to its clean side and drag it back across the sensor. 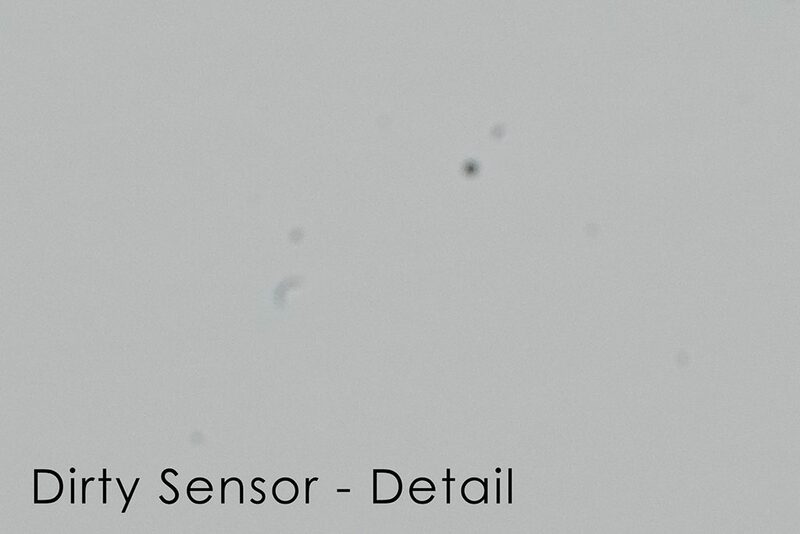 Cap the camera body and discard the swab, then repeat the earlier process to check the cleanliness of the sensor. If it’s not spotless (or just not cleaned to your satisfaction) repeat the process. Going forward, work to keep your sensor clean by always turning off the camera before removing the lens, and never change lenses in dusty conditions.